Growing your business is not an easy task and not even a rocket science as well. Marketing yourbusiness needs lots of budget that makes small and startup businesses quite hard to compete others companies, who have already hold firmly their roots in the market. But knowing and identifying the right marketing strategies can attract more customers and clients to your business even if you don't have a large marketing budget. 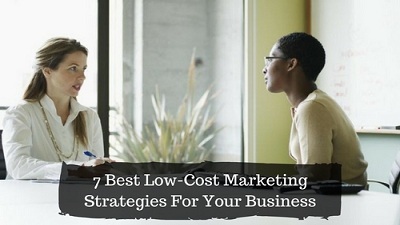 So I'm going to share with you 7 best low-cost marketing strategies that you can use outside of social media to start attracting new customers into your business right away. Credibility marketing gives you and your company featured in online media within your industry when they already have tons of traffic. For example; if you are an entrepreneur you might want to get featured on small business, entrepreneur, or business insider. These platforms have online submission forms where you can suggest article titles or blog posts that you'd like to write for the platform. And if they like your submission, then they will actually feature your article on the website and won't cost you anything and they usually that you put a small bio and a link back to your website. Which ultimately brings traffic and build backlinks to your website. So, they've already got thousands and tens of thousands of views on their platform every day if you could get it on there then some of that traffic will be filtered over to your website leading to new customers and clients for your business. Networking is tried-and-true and has been around since the beginning of your business. What you need to do is find some local events with a commuting that you can attend to start connecting with people within your industry and potential customers within your industry. A lot of time networking events will give you like a 30-second spotlight will you be able to give your elevator pitch that's a great way to get all eyes on you while you're sharing your marketing message. You can also connect individually one-on-one with people who you think might be customers and clients for your business. Now there's a simple formula that you want to follow when you're doing this is the LAS formula. The first thing you need to do is to listen. Listen to what it is they do and a lot of times you'll hear what it is they currently need. You want to ask clarifying questions and ask questions just to let them know you're engaged and we're actually listening to what they said and once you've done that then you can share about your business, your products and services and how you think they may be a good fit to help them solve the current problem they're having. Did you know that YouTube is the second largest search engine, that means when people are looking for how to solve something they go to Google first and next they go to YouTube. So, you and your business should be there and you can create simple short videos where you share your information that's relevant to your customers and clients. Videos allow you to become known as the go-to expert and you get to attract new clients to your business. Can you simplify the information? Do you have a new tip or technique that will help the information be better? So, research and look for a way to improve and then make sure you are consistent and you may commit to putting out a new video every week so that you can start to build an audience and people. Mail marketing is an old-school for real but it's still tried-and-true. If your customers are a consumer and you are marketing directly to your consumers, then you can get a postcard mailing that goes out to all of the homes within a particular zip code or a set of zip codes. This doesn't have to be really expensive I've seen some organizations that will do it for you for as little as 5 cents per postcards. So, if you were going to send your postcard out to a thousand homes that will cost you around $50 and I think that's not too bad. If you're marketing directly to other businesses that is a different way for you to go about the mail marketing. What you have to actually do, is identify some businesses within your local area of who you think could benefit from your products and services. Then send out customized individual letters to each one of those businesses introducing yourself and your company and the products and services that you sell. Once you send those out then you follow up maybe a week later by phone but this is not one you want to outsource to another company to do you actually want to take the time to do some research on the company and make sure they're actually a good fit to be a customer. This is where you give just a free 45 minutes or 60-minutes training, where can address some urgent problems, needs & wants or desire that your customers are currently facing and share your expertise and knowledge about how to get that problem resolved with them. You don't have to give away your whole processor system but you need to give them enough so that they can actually see that you are an expert in your area and it will be a good fit for you to help them solve that problem with the webinar you want to. Make sure you're providing a ton of valuable and relevant content for your viewers and once you get to the end of it then you tell people how they can work with you further. Here you have to identify strategic partners who are serving the same customers and clients as you. You need to find someone who provides complementary products and services for your target audience. For example; if you are a dressmaker you might want to partner with a shoemaker and that partnership could look like you offering a coupon for shoes for everyone who buys a dress from you and that shoemaker doing the same. So, that way you've got customers who are coming to both businesses and you both win. You could even do some marketing together and split the cost. There are a lot of different ways that you can implement partnerships so just kind of think outside the box about some ways that you could connect with another business owner who serves in your same audience. In this marketing strategy, you have to identify some upcoming conferences, expos, trade shows, luncheons, breakfast meetings which have speakers come in and reach out to the event planner and see if they are still accepting applications for speakers. Even if you've got an opportunity to speak for 30, 45 or 60 minutes it's a great way to show your audience that you are the go-to expert in your industry. If you can't find any conferences or Expos, you can host your own engagement. You can go to a local business incubator, a local community center or even a library and rent out a room for a little to nothing where you can invite people who would be potential customers for your business and give them a free presentation. Speaking in person and hosting your own workshop is like the impersonal version of the webinar. It's just an opportunity for you to share how you can solve your target audiences most pressing urgent need want or desire and it's a form of marketing that doesn't have to cost you a lot of money. So, I hope this 7 low-cost strategies outside of social media have helped you and I think you can start to end right away and I want to hear from you which of these 7 have you found for yourself to implement into your business. Leave me a comment below and let me know and if you found or just even a little teeny bit of value from this article.